The Phrase Game, developed by That’s So Panda, is a puzzle game which gives you over 50 common phases and idioms to solve. This game will put your brain to the test to see if you can solve all of the puzzles. The concept is pretty easy. You will be shown a drawing for each puzzle with a bunch of letters at the bottom of the screen and blank spaces underneath the drawing. You will have to use the letters to correctly fill in the phrase to complete the challenge. If you are stuck on a certain phrase, you can ask your friends for help with a click on a button. You can connect with them through Facebook and Twitter. There is also a skip button, which allows you to skip 1 phrase per day, and a hint button that w ill take away some of the letters on the bottom to help make it easier for you to solve. Overall I think this game is very fun and challenging. I am addicted to it and want to complete all of the phrases, but some of these are very challenging. I am stuck on one right now and just asked some friends for help. Applications that stimulate and challenge your brain are great for people of all ages, although this might be a bit too tricky for some younger kids. Hopefully the developer will continue to add more phrases to solve in future updates. They said that they will continue to update the app so that is a good sign! 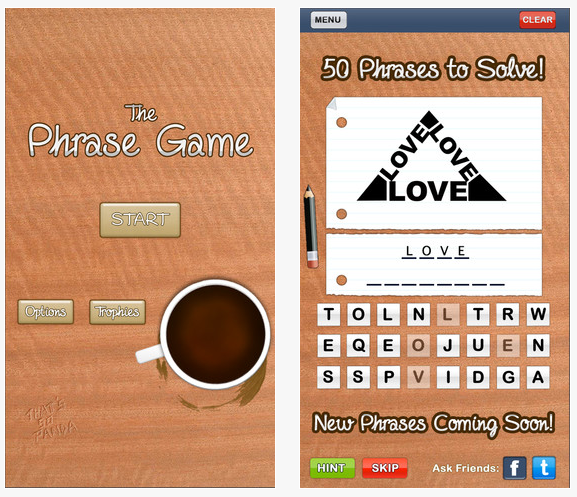 The Phrase Game is priced at just $0.99, and it is a universal application, so you only have to purchase it once to play on all of your iOS devices. I would highly recommend this game for anyone who loves to solve problems and enjoys challenging puzzle games.